The Visio Web Access (VWA) web part for SharePoint 2010 can be used to display and interact with Visio documents. 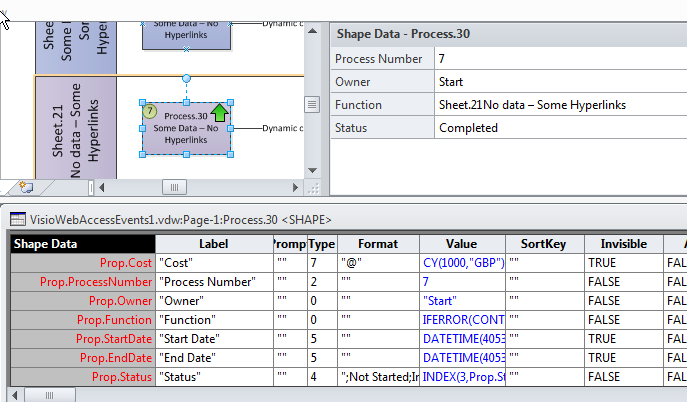 The VWA web part includes a Shape Information pane that can be used to display the hyperlinks and shape data of each Visio shape. This article describes how to control the information that appears in this pane. 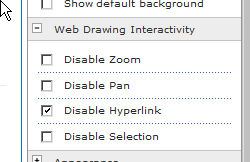 The Visio Web Access web part for SharePoint 2010 itself has the ability to inhibit interaction with hyperlinks or shape selection by using the Edit Web Part properties panel. The hyperlinks of a shape can still be available from the Shape Informtion pane, if you have not hidden it. Active hyperlinks on a shape can get in the way of selecting it in the VWA web part, so Disable Hyperlink is usually required. The VWA web part does not respect layers unless the shapes on a layer are actually invisible; thus just locking a layer in Visio before saving the document to SharePoint does not have any effect in the VWA web part – shapes will still trigger mouse and selection changed events. It can be necessary to limit the visibility of certain Shape Data fields from general view. In the following example, I have chnaged the Invisible value for the Cost, StartDate and EndDate Shape Data rows to TRUE. This has the effect of hiding these rows from view in the Shape Data window. Similarly, when the document is saved to Visio Services and viewed using the VWA control, then the same rows are hidden from view in the Shape Information pane. It can be useful to utilise the Send Shape Data To another web part from the Visio Web Access web part, however this has the unfortunate side effect of causing the VWA web part to refresh each time a shape is selected. There are subtle differences in the way that Visio and the VWA control display shape related information, so beware! The only Visio layer property that has any effect in the VWA control is Visible … locking a layer does not prevent its shapes from being selectable when viewed in the VWA web part. If you want to control the visibility of Shape Data rows, then consider changing the value of the Invisible cell to TRUE using a cell formula or code, however Hyperlinks will always be visible, unless the whole shape is invisible.